Product prices and availability are accurate as of 2019-04-14 03:35:59 EDT and are subject to change. Any price and availability information displayed on http://www.amazon.com/ at the time of purchase will apply to the purchase of this product. Establishing excellent dental hygiene is crucial for babies and toddlers, and it is never to too soon to instill great habits for a healthy smile! This set from Jack N' Jill - featuring Dino Bio Toothbrush, Hippo Rinse Cup, and pack of 2 Raspberry Natural Toothpaste - contains everything needed to make brushing fun, conveniently bundled together. 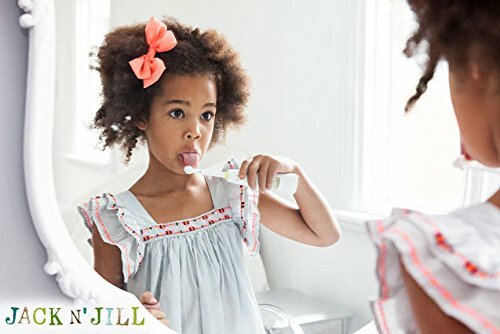 The 2 pack of Jack N' Jill Natural Toothpaste, included, is perfect for a little one who is teething. This organic toothpaste is rich in Xylitol and Calendula to soothe sore gums. Eco-conscious parents will appreciate Jack N' Jill's Earth-friendly designs: both cup and brush handle are biodegradable within 90 days in commercial compost! Additionally, all three components are BPA & PVC free. FUN TO BRUSH: Establishing excellent dental hygiene is crucial for babies and toddlers, and it is never to too soon to instill great habits for a healthy smile! This set from Jack N' Jill - featuring Dino Bio Toothbrush, Hippo Rinse Cup, and pack of 2 Raspberry Natural Toothpaste - contains everything needed to make brushing fun, conveniently bundled together. 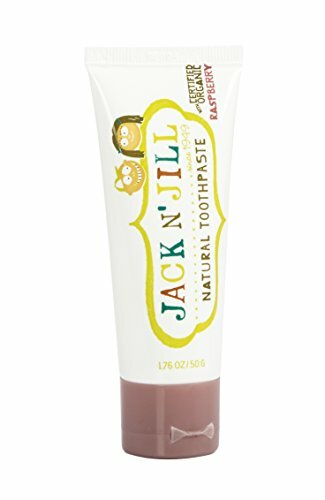 TEETHING RELIEF: The 2 pack of Jack N' Jill Natural Toothpaste, included, is perfect for a little one who is teething. This organic toothpaste is rich in Xylitol and Calendula to soothe sore gums. Added bonus? The yummy raspberry flavor will have your child looking forward to the task of brushing teeth! SAFE & HEALTHY: Rest assured your little one can safely use this set. Toothpaste is fluoride, sugar, color, SLS, and preservative free, and features a safety seal and easy open flip top cap. Hippo cup, which can be used to rinse as well as hold brush, is dishwasher safe. Dino brush's soft nylon bristles are gentle on gums. Additionally, all three components are BPA & PVC free. ECO-FRIENDLY: Little boys and girls alike will love the cute characters, a green dinosaur on the toothbrush and a purple happy hippo on the rinse cup - while eco-conscious parents will appreciate Jack N' Jill's Earth-friendly designs. Rinse cup is made from bamboo and rice husks, and both cup and brush handle are biodegradable within 90 days in commercial compost! SIZE SPECIFICATIONS: Toothbrush dimensions measure 6" x 1" x 1". Rinse cup measures 3.4" x 3.4" x 5.1". The 2 pack of Natural Toothpaste tubes contain 1.76 ounces each.